Prime Minister Theresa May is writing to the EU to formally ask for Brexit to be postponed. One ministerial source told the BBC the longer delay could be up to two years, amid reports of a cabinet row, but No 10 said no decision had been made. EU Brexit negotiator Michel Barnier said the EU would not grant a delay without a "concrete plan" from the UK about what they would do with it. Under current law the UK will leave the EU with or without a deal in nine days. MPs rejected the withdrawal deal Mrs May has negotiated with the EU for a second time last week by 149 votes. They also voted in favour of ruling out leaving the EU without a deal, and in favour of extending the Brexit process. The prime minister had hoped to have another try at getting MPs to back the deal this week - but Speaker John Bercow effectively torpedoed that with his surprise intervention on Monday. She still hopes to ultimately get it in front of MPs for a third go, but says even if that happens and they vote in favour of it, the UK will need a short extension to get the necessary legislation through Parliament. A cabinet source told the BBC she therefore plans to ask the EU to agree to postpone the UK's departure until 30 June, but with an option of a longer delay as well. Mrs May has warned Brexiteer Tories that a longer extension will be needed if her deal does not get through Parliament. 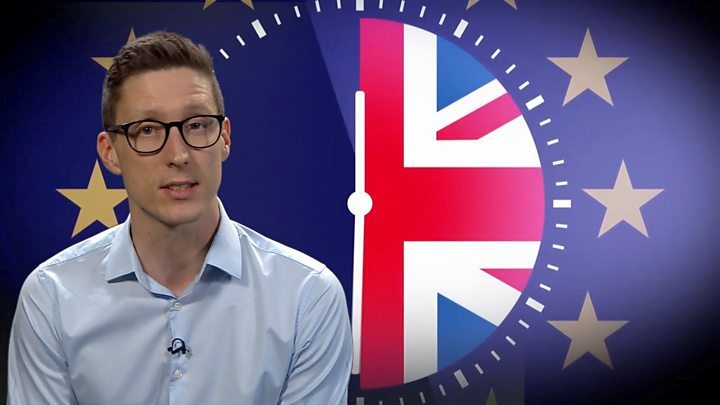 Media captionWill the UK leave the EU on time? One ministerial source told the BBC's Laura Kuenssberg there was "no agreement" around the cabinet table when a delay was discussed. Another cabinet source said they were frustrated that the PM had not been clear about which delay option she would be arguing for. Commons leader Andrea Leadsom is said to have criticised colleagues, saying they now amounted to a "Remain cabinet", not a "Brexit cabinet". Chancellor Philip Hammond said ministers all wanted the "shortest possible delay" but cabinet members "have different approaches to how we should do this". Any delay will have to be agreed by all 27 EU member states and Mrs May is heading to Brussels on Thursday to discuss the options with fellow leaders. Meanwhile, former Prime Minister Tony Blair, who campaigned to remain in the EU, told BBC Newsnight that the question of whether to have another referendum was "for a later time". Although leaving without a deal was still the default position, Mr Blair said a no-deal Brexit "won't happen", adding that the challenge now was making any extension to Article 50 count. Mr Blair called for a delay of between nine months and a year to "allow Parliament to reach a conclusive opinion on the central Brexit question - soft or hard?" On Monday, the Speaker said he would not allow a third "meaningful vote" in the coming days on "substantially the same" motion as MPs rejected last week. How could Article 50 be extended? 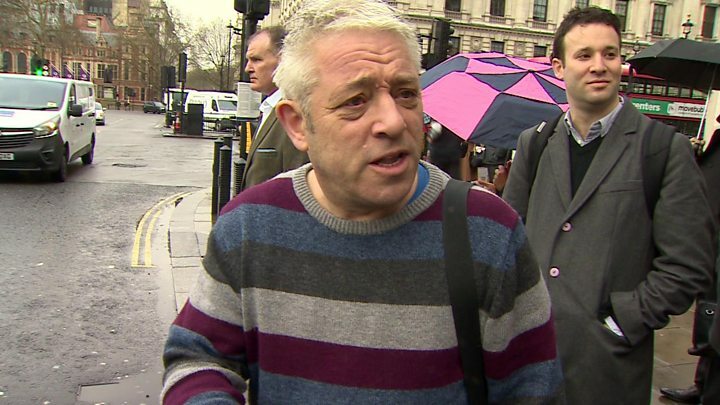 Mr Bercow declined to discuss the reasons for his decision when questioned by the BBC, as he made his way in to Parliament the following day. Brexit Secretary Stephen Barclay suggested a third vote on the Brexit deal could take place next week - after Mrs May has sought a delay. On Mr Bercow's ruling, he said it was important to "respect the referee" and abide by his decisions - but, he added, the Speaker himself had said in the past that if Parliament was guided only by precedent then "nothing ever would change". At a news conference in Brussels, Mr Barnier said it was up to the 27 EU leaders to decide whether to grant a delay, based on what was in the "best interest" of the bloc. But for a longer delay "there needs to be a new event" or a "new political process" - so that "we are not back in the same situation as today". "Extending the uncertainty without a clear plan would add to the economic cost for our business but will also incur a political cost for the EU," said Mr Barnier. "It is for the British government and Parliament to decide very quickly what the UK wants to do next." Mr Barnier also warned that UK MPs voting against "no deal" would not prevent it from happening, saying that "everyone should now finalise all preparations for a no-deal scenario". BBC Europe editor Katya Adler said the EU had "little trust" in the prime minister, with some leaders wanting to see proof from Parliament that MPs would support a longer delay before the EU signed up to it. 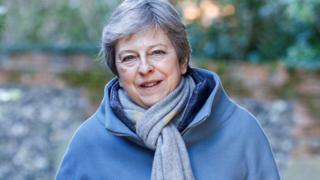 She said there was "irritation" that those at Westminster appeared to be "inward-looking" and were not taking into account the cost of a delay to the EU. And she said the EU's final decision on a delay may not be given this week, with talk of an emergency summit on 28 March. Earlier, German Chancellor Angela Merkel said she would struggle until the last possible moment to achieve "an orderly Brexit", saying the interests of Germany, Britain and the EU were at stake. Taoiseach (Irish PM) Leo Varadkar and European Council president Donald Tusk released a joint statement after their meeting in Dublin. "They agreed that we must now see what proposals emerge from London in advance of the European Council meeting in Brussels on Thursday," it said. Labour leader Jeremy Corbyn said the Speaker's intervention showed Mr Bercow was "ensuring Parliament is taken seriously". He said he had spoken to Conservative and Labour MPs about a so-called Norway-Plus style of future relationship with the EU - a closer one than Mrs May's deal would bring about - calling it an "interesting idea" which had not got his "complete support". When asked about another referendum, he said: "The issue has to be put to the people after Parliament has made some kind of decision." He said a public vote had to be on a range of options, saying: "It cannot just be on Theresa May's deal or Remain - there has to be some choice for the people." Mr Corbyn also held "constructive" talks with the Westminster leaders of the SNP, Liberal Democrats, Plaid Cymru and Green Party about the potential to unite around a closer future relationship with the EU, a Labour spokesman said. But Liz Saville Roberts, Plaid Cymru's Westminster leader, suggested the Labour leader had not really engaged during the meeting with the case for giving the public the final say on Brexit. "We were there to talk about a People's Vote and the only thing I felt he was comfortable talking about was Labour's version of Brexit," she said.